Ever FINALLY sit down at your computer for a writing session after a long day, and feel utterly exhausted, even if you’ve done very little physical activity? You might be able to look at your outline and start writing, but when you come to a decision on what your character is supposed to do or say, you just can’t move the story forward. So long as you are coasting along, you are fine, but when it comes to choosing A or B, you just stare at the screen. Or, you simply just can’t find a place to start, even if you know what happens? This may not be writer’s block, issues with the plot or character, or even an issue with your story at all. It could be decision fatigue. Just like your muscles, your brain can get exhausted after continued use, such as decisions. Normally, you are able to decide on a variety of things over the course of a day, but if you are making many decisions, especially in rapid succession, you will tend to make rash ones that may not be beneficial in the long run. This action leads to several things such as poor choices, setting aside important tasks until later and even avoidance of a task altogether. People who multitask, have children, more than one job, or have a job where they continuously making rapid decisions, will feel the effects of this most often, but anyone can have decision fatigue. But luckily, it is something you can manage. The first way to eliminate some of the fatigue you might encounter daily is to reduce the number of decisions you make especially early in the day. Usually, people make a lot of decisions in the morning. In your usual early day routine you probably: shower, pick out clothes (yourself and children or other loved ones), fix hair, make yourself look presentable, eat breakfast, pack a lunch, decide on transportation, take care of transportation needs if you need to, check emails, social media, text friends and family, etc. Throughout the day you make decisions at work, then come home to decide what to eat for dinner, what to watch on TV, if you are going out with friends, balancing the checkbook, paying bills, laundry, dishes, housework, taking care of pets and family, and so on and so forth. Just those decisions alone can sometimes be overwhelming. Then comes the creative decisions we need to make to be able to write, draw, and create whatever type of thing we do. Creativity relies on being able to make decisions, and when that ability is exhausted, it’s a wonder sometimes that creatives even manage to do it at all!. It’s good to make a list of all of the things you make decisions about, and what time you make those choices. If you make a lot of selections in the morning (what to wear, eat, etc.) simplify that to making those decision in the evening. Make your breakfast the night before and your lunch while you are at it. Set out your clothes, decide on how to wear your hair, take care of transportation needs before you get home. By switching the times you make those decisions, you stay on track a bit better. Some of these tasks, such as meal prep for lunches can be done once a week if you learn how. If you’ve scheduled your writing time in the evening, but find you really don’t have the brain power at that time many nights, try getting up early and writing in the morning before you do anything else (besides a cup of coffee that is.) It might be difficult at first, but having a fresh mind that isn’t exhausted at the end of the day, can help you make progress. Real life is difficult to keep up with, but when you add in creativity, promotion, and networking, it can really get complicated. Simplifying life takes planning which is why schedulers and planners are a great idea for basically anyone. First, by using some sort of scheduling, you can easily see what days you will have a lot of decisions to make. If, for example, on Tuesdays, you have to give presentations for work, or have a talk with your agent or editor, you might not want to schedule that big fight scene for your writing session that day. It might be better to skip ahead to something that requires less brain power. Second, by planning out the week or even the month, you can get a lot of decisions out of your way. Plan out a weekly menu—this can simplify dinner decisions and grocery shopping (two annoyingly stressful decision sessions for a lot of people). Know what days you have to do certain house related chores such as laundry or dishes. Schedule exercise and self care time (often overlooked). What days you will schedule promotion, social media time, or family time. Third, you can use schedulers and planners to break up tasks. Have a report due at work, school or for a colleague in a week? Research it one day, make an outline the next, write it another then lastly edit and refine before sending it off. Lots of other tasks and decisions can be broken down or gathered into one planning session. Even if you aren’t able to do everything on your planned list every day, at least some of those decisions on what to do and when to do it will already be made. If you are any sort of creative, you probably have something to sell. Whether it be crafted items, art, or books and stories, getting those pieces sold means reaching out and connecting with people. Besides face to face contact, the simplest way is social media. But you don’t have to be online all the time. Social media managers and a few tricks can simplify your life greatly. Social media managers are programs that centrify your social media accounts, allow you to create scheduled posts, and help you monitor your reach. These three things can help you limit decision fatigue greatly. First, centrifying your social media accounts means that you are going to only one place to check your accounts. You can easily switch from one to another without having to open up a new tab and logging in. Second, the ability to schedule posts helps you limit your social media time. Social media can lead to not only decision, but emotional, fatigue as well. If you have your promotional posts scheduled for the week, you don’t need to check in daily, unless you want to. And for some, that means more time for writing. Like schedules and planners, spreadsheets are an essential tool for promotion. This is a new trick I just learned, and believe me, it helps tremendously. For every book or story you write, you should do promotion, and not just for a day or even a week. Promotion should be a long-term action of importance. It doesn’t have to be complicated though. Weekly reminders on FB and daily ones on Twitter, can improve the visibility of your work. Improved visibility can lead to more fans, a bigger support system, and even offers of work. So to get the most views, it’s the author’s job to get the work out there. To do that you need promotional copy. This is usually a short blurb or sentence that describes the work, where to find it, and other information. To promote effectively, you are going to need more than one of these. Four to five different blurbs per story or book is enough. For FB, use one of those blurbs per week. For Twitter, use one a day. If you have multiple pieces out there, spread out the FB posts so that you have something up once a day, and post one Twitter per sold story per day. You can post once an hour if necessary. If you have several works out, even by using a list, this will get complicated quickly. If you use a spreadsheet, you can either upload a schedule onto a social media manager or use the spreadsheet to manually upload a week’s worth of posts into various accounts. If you have your promotional copy already written and the time of which those posts need to go up, you’ve just eliminated a great deal of decisions. It’s just simple copy/paste. Our modern world requires us to make a variety of decisions daily, but some of those can be eliminated with a little bit of planning, simplifying our lives, and using programs to make our lives easier. It does require a little more work to start, but the results can be life changing. Sometime, long ago, Jennifer had the idea for an ABC book. It was dark, creepy, and awfully cute. However, Jennifer had no skill at art. Thus, A is for Apex sat in the "hiatus" file for years. Then Jennifer met Elizabeth. Jenn liked her art style. Jenn liked her. Jenn thought they might work well together. They auditioned each other on The Prince of Artemis V, a comic book version of Jennifer's most popular YA short story to date. Everyone liked it and they thought, why not do another project together. 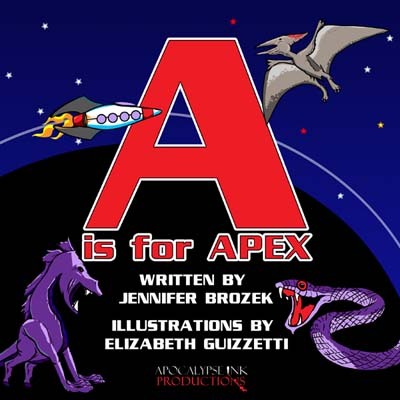 Rubbing her hands together, Jennifer asked, "Have you ever wanted to do an ABC book?" The gleam in Ellzabeth's eyes was answer enough. Apocalypse Ink Productions presents, A is for Apex! Learn the English alphabet with this one-of-a-kind book for the little ghoul in your life. Monsters, mayhem, graveyards, and a zombie named Oscar, mixed with a little bit of science, come to life in charming rhymes and illustrations. Each letter receives its own two page fun illustration to spark the imagination of you and your little ghoul. There are many details to be explored during every read. This book is dedicated to all the little mad scientists out there, especially those who like the creepy stuff. We hope you all love this book.